ALBANY (Scrap Monster): The supporters of the legislation imposing 10-cent fees on plastic and paper bags have intensified their campaign by pushing the Mayor to pass the bill by Earth Day. Council members Brad Lander and Margaret Chin along with their supporters rallied at City Hall in support of the legislation. According to them, the use of single-use plastic bags is hurting the environment and causing financial losses in millions to the City. These plastic bags are found to clog recycling streams and pollute oceans. Moreover, disposal of these non-biodegradable bags cost the city approximately $10 million per annum. According to the proposed legislation, groceries and retail stores can charge 10 cents fee from the customer on every sale of plastic or paper carry bags. 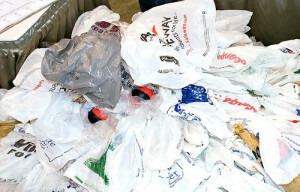 The proposed charge would not be a tax and the stores are authorized to keep the money to cover the cost of bags. Restaurants are exempt from the above legislation, due to limited available alternatives. Any store that breaks the rule twice shall be charges with a fine of $250. The proposed surcharge is being opposed by The American Progressive Bag Alliance which claims that plastic bags being used in the City are 100% recyclable and that the administration should concentrate on boosting proper reuse and disposal of plastic bags. It also noted that the legislation would add $2-$4 per week to the shopping bill of poorer New Yorkers. As of Monday, the bill fell short of 5 votes for a majority to bring it to vote. Meantime, the supporters of the bill have sent a letter to Council Speaker and Mayor, requesting to consider the bill so that it could be passed by Earth Day.